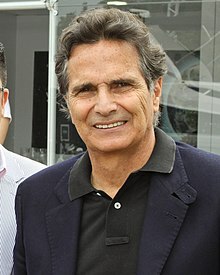 Nelson Piquet Souto Maior (Portuguese pronunciation: [ˈnɛwsõ piˈke], born August 17, 1952), kent as Nelson Piquet, is a Brazilian umwhile racin driver an businessman. Syne his retirement, Piquet haes been ranked amang the greatest Formula Ane drivers in various motorsport polls. ↑ "Formula 1's Greatest Drivers – AUTOSPORT.com". F1greatestdrivers.autosport.com. Retrieved 2013-01-04. ↑ "BBC Sport – Formula 1's greatest drivers". Bbc.co.uk. 2012-11-20. Retrieved 2013-01-04.